Women may spend as much time grooming their bodies as men, and may like what the Panasonic ES246AC Bikini Shaper & Trimmer has to offer. 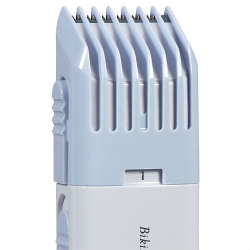 This small trimmer is in a narrow rectangular shape, with a light grey plastic body. This shaper and trimmer is both compact, portable, and adjustable. It’s designed primarily to shave the bikini region, and isn’t suitable for other purposes. This trimmer is cordless, battery-operated, and can be used wet. You’ll be able to use the Panasonic ES246AC Bikini Shaper & Trimmer to safely and comfortably shave, trim, or maintain the sensitive bikini region of your body. It has a silver trimmer at the top, with protective light mauve-grey plastic comb. This comb is detachable. It pushes on or off with a push button on the side. 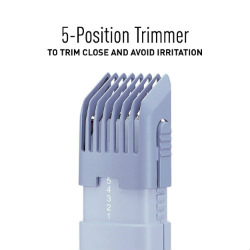 This trimmer head is a five position trimmer, so that the comb is adjustable for when women want to shave their bikini region, but don’t want to shave all their hair off. The combs allow for a closer trim, but will avoid irritation. This comb also works as a shaping guide. You can choose the length of hair that you want to keep. 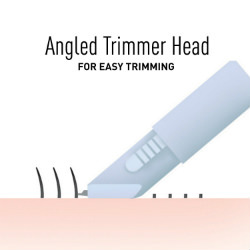 The head of this trimmer is angled, making it easier to hold in the hold for shaving or trimming. The angle will also be more effective at cutting and removing unwanted hairs more quickly. The blades are super sharp and are also hypo-allergenic, which will minimize after-shaving irritation and redness. The hypoallergenic blade is made from stainless steel, which has been proven to be the best metal for people who suffer from nickel or other metal sensitivities. It contains a special bikini razor blade that is designed for use on sensitive skin. You’ll be able to shave as close to the skin as you want, but to avoid getting irritated skin or those razor bumps that can occur after using a traditional razor. 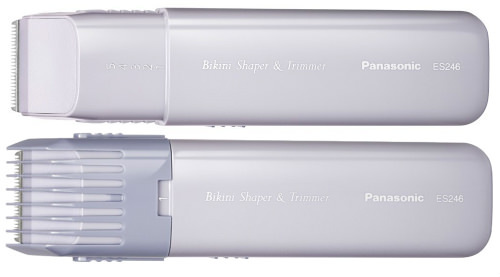 The Panasonic ES246AC Bikini Shaper & Trimmer head has nicely soft and rounded tips. It’s safe for even the sensitive bikini regions of your body. You’ll find that this trimmer is lightweight and portable. 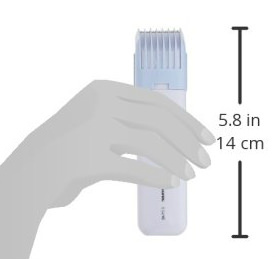 It only measures 1.3 inches in width, so you’ll be able to shave anywhere. You’ll find that it provides for a close, convenient, and comfortable personal shaping and trimming experience. It will nicely flow over your skin to shape and groom. It will trim hair from 3 mm to 15 millimetres, so it won’t be suitable for other shaving purposes. It’s not only cordless, it also runs on batteries. You’ll need to add two AA-sized batteries which are not included. You can purchase a rechargeable AA battery kit, so that will minimize adding more garbage to the landfills. The trimmer has a mauve oval on/off button on the side. It pushes up for on and down for off. The Panasonic ES246AC costs around $20, making it an affordable purchase for any woman. It’s a great second shaver that will work much better than your regular lady’s leg shaver. The reviews are favourable for the Panasonic ES246AC Bikini Shaper & Trimmer, being 4.2 out of 5 stars. 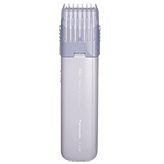 In the package you’ll get one Panasonic ES246AC, a shaping comb, and a cleaning brush. 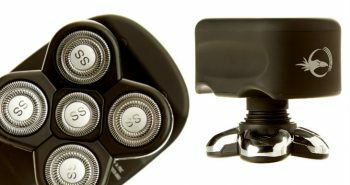 The shaver measures only 1.3 inches across. You’ll need to buy two AA batteries which will give you forty-five minutes of shaving time. 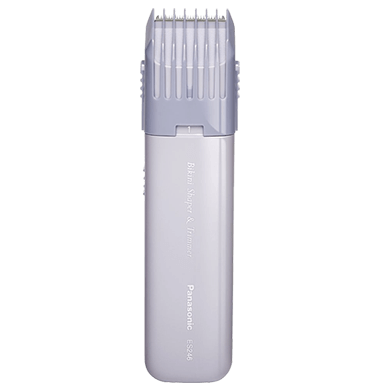 The Panasonic ES246AC Bikini Shaper & Trimmer measures 5.45” x 1.34” x 0.94 inches, and weighs about a quarter of a pound. 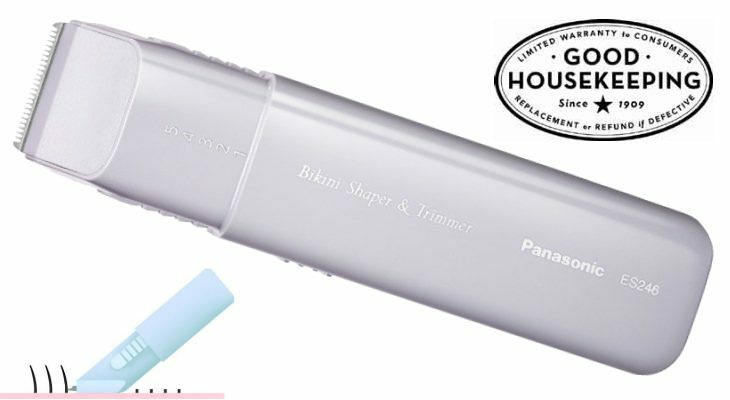 You can purchase replacement blades for the Panasonic ES246AC Bikini Shaper & Trimmer when you find that your trimmer is no longer is shaping or trimming as well as it did when new. You’ll want to order part number WES246A1058, and the price is about half the cost of a new trimmer, so it’s still worth replacing. 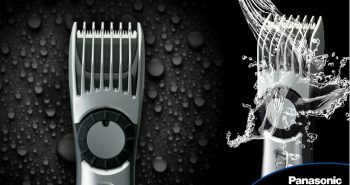 If you’re trying to decide between this hair trimmer and a different brand, there are some considerations. The Panasonic ES246AC can be a bit loud and noisy. It’s also not rechargeable, which can be a nice convenient feature to have, considering that women need to shave several times a week. While you can purchase a rechargeable battery kit, you still have to remove and insert fresh batteries. 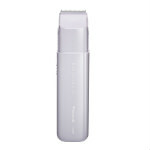 Women will also need to have a second cordless shaver to do their legs or underarms.